Whether you are an avid espresso lover or like the occasional cappuccino, espresso machines enable you to make good quality coffee from home or the office. Espresso machines are an investment and we understand how important it is for you to make a good investment on a machine that is perfectly suited for you and your budget! To assist you in making a smart espresso machine decision, we have put together this espresso machine buying guide with everything you need to know to easily choose the perfect espresso machine. 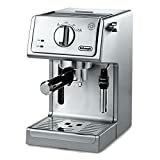 Steam Driven Espresso Machines: These machines make a strong coffee that is closest to the authentic espresso flavor without being classified as espresso - for affordable prices. With a quality that’s between filter and restaurant espresso, they are an ideal step up from instant and are best suited for students or novice espresso drinkers. Pump-Driven Espresso Machines: Pump-driven espresso machines pump water from a boiler, passing it through grounds before reaching your cup, and they can range from small at home machines to big machines suitable for restaurant use. 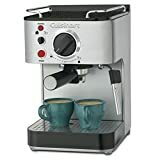 Semi-Automatic Espresso Machines: These are easy to operate espresso machines where you control how much coffee comes into the cup but pushing a button to stop and start the brewing, allowing you to add or remove coffee between shots. 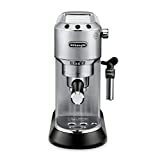 They are the most affordable option when buying pump espresso machines. 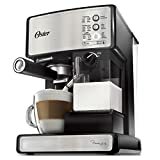 Automatic Espresso Machines: Automatic espresso machines automatically stop when the coffee is done. A lot of these machines use proprietary pods, which is a system that is easy to clean and operate. These automatic machines are ideal for people who want coffee at the push of a button without additional work needed. Super Automatic Espresso Machines: These machines not only make coffee with the push of a button but grind the coffee beans as well! Leaving virtually no work to the user, this machine is the most convenient option for getting good quality coffee. Manual Espresso Machine: There are two types of manual espresso machines: Piston and direct lever espresso machines. Piston-driven espresso machines are old-school machines that require users to manually press water to make coffees. Because they are an older technology, they are better suited to the coffee enthusiast looking for something retro. Direct lever espresso machines require users to manually pump or force water through the coffee, and also require a little more coffee making knowledge and know-how. Air Pressure-Driven Espresso Machine: These espresso machines have been designed to be compact enough to be portable and normally only make one espresso shot at a time. These are perfect machines for people who are traveling and want to make sure they have good coffee wherever they go. Single-serve/Pod Espresso Makers: These machines make one espresso at a time by inserting a pod (or cup) with pre-measured coffee. They are small and compact, taking up very little space, and fall into the automatic espresso machine category. Because they are exceptionally easy to use and clean and offer no mess or fuss, they are a popular office and home machine. Build: The build size of a machine is normally the first point a new owner of an espresso machine will comment on, and machines that take up less counter space are much more likely to get high ratings. Style is also a top concern to reviewers - as the espresso machine is in plain site, looks matter. By choosing a machine to match your taste and kitchen size, you are guaranteed much better product satisfaction. Water reservoir: Water reservoir size is a big talking point among online reviewers. While it is true that bigger reservoirs get better reviews, this is a matter of how many espressos the reviewers are making per day. Regular espresso makers like the convenience of bigger water tanks while irregular drinkers don’t mind the smaller, more compact options. Although, in both cases they agree the water reservoir needs to be easy to remove and put back! Operation: It is important to users that their espresso machines are easy to use and are fast to heat up, and machines that are, are rated much higher than those that aren’t. This is because these two operational tasks add up to a good quality espresso in less time with minimal effort. When choosing an espresso machine size, consider where you will store it and for how many people you would like to make coffee for at one time. Even if they only make one shot at a time, smaller, fast brewers are ideal for smaller families and offices. When making coffee for guests, or if you have a bigger family, two or four shot machines will be more convenient options for you. More often than not, espresso machines will sit on countertops, so picking a machine that is appealing to look at and fits into your personal style will go a long way toward buyer satisfaction. Water reservoir size is definitely worth some forethought. The bigger the water reservoir, the more espressos you will be able to make before having to fill up. If you don’t plan to make espresso frequently for more than one person, then a smaller reservoir will fit you perfectly. For bigger families and more regular coffee drinking, aim for something that can make up to 8 shots at least for more convenience. Check your power supply and make sure you choose a machine that is compatible with it. Multiple cup sizes to easily make double shot coffees. Automatic milk frothers (or a steam wand) to make milk for the perfect cappuccino. A removable drip tray for easier cleaning. A warming tray (or cup warmer) which is normally a plate under the cup that keeps it warm while the espresso is dripping. A hot water dispenser making it easy to add some hot water to your espresso to make an Americano or make tea for the non-coffee drinkers. Adjustable coffee strength options, to ensure you can make espresso just the way you like it. An included bean grinder will save you the hassle of buying your own coffee grinder separately. For more coffee options, consider a combination espresso machine. Combination machines that accept pods and ground coffee too will offer the most versatility and are a good investment for serious coffee drinkers. Other combination machines can include a regular coffee brewing pot for those guests or family members who prefer filter over espresso. DeLonghi: Founded in 1902 producing air conditioners and heaters, and expanded to include small domestic appliances, Delonghi are well known for their Artista espresso machines. They sells appliances in 75 countries. Gaggia: The Gaggia company was founded in Milan after Mr. Gaggia invented the first espresso machine in 1948, and within a few years, they were exporting commercial coffee machines to the United Kingdom, the USA, and Africa. Considered coffee connoisseurs, Gaggia machines are the epitome of quality. 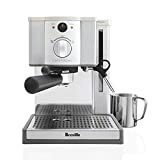 Breville: Breville, known for inventing the sandwich toaster, has more than 10 different espresso machines in their line-up. As a name synonymous in Australia with toasted sandwiches, they are striving to do the same with espresso. Nespresso: Beginning in 1986, Nespresso redefined the industry by changing the way coffee was prepared in homes and trying to provide a way for customers to have access to excellent coffee that was easy to make. Today, they offer a variety of capsules to suit any taste and are one of the most popular machines.